GOT ANY RUBBISH TO GET RID OF? Reliable local man with van available for all your removal, collection and delivery needs. We can clear a single item or a full house, garages, sheds, lofts, household and garden waste. Anything considered, give us a call to discuss your requirements, we will be more than happy to help. From making the first call, my rubbish was removed within an hour. 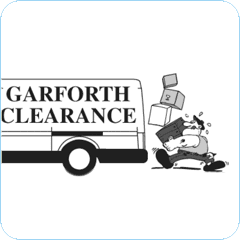 I’ve used another company recently and they charged double, so I’m pleased I found Garforth Clearance – they’re HALF the price. Friendly, efficient – I won’t use anyone else from now on.